Aircraft provide a necessary perspective on earth system processes and serve to complement NASA satellite missions. Instruments on aircraft provide in situ measurements and high resolution imagery that enable on-orbit sensor calibration and algorithm development and validation. Unmanned Aircraft Systems (UAS) are of particular value where long duration or long range measurement requirements preclude a human pilot, or where the remoteness and harshness of the environment put pilots and high value aircraft at risk. The CASIE mission does well to demonstrate the need for both of these criteria and complements arctic sea ice measurements collected by ICESat. 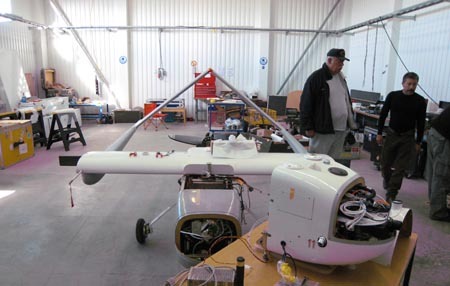 The Science Instrumentation Environmental Remote Research Aircraft (SIERRA) is a medium class, medium duration UAS originally designed by the Naval Research Laboratory (NRL). 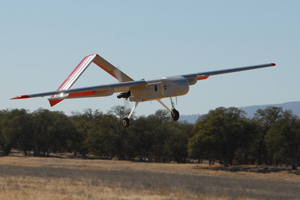 Researchers at the NASA Ames Research Center developed a partnership with NRL to evaluate the utility of this class of aircraft to the NASA earth science community. The relatively large payload (~100lbs) coupled with a significant range (500 miles) and small size (20ft wingspan) makes it an attractive observational platform that complements the current suite of modified NASA science aircraft. 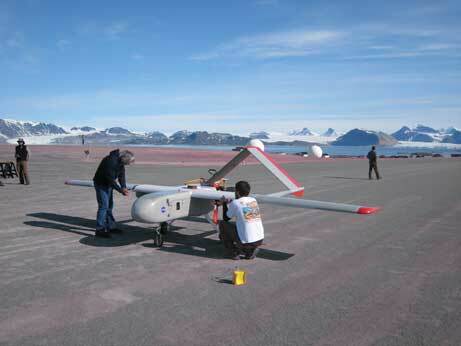 This UAS conducts very low altitude missions for tropospheric chemistry sampling and remote area surveys such as arctic ice reconnaissance. For this mission the payload suite includes 2 laser altimeters, a synthetic aperture radar (SAR), zenith- and nadir-pointing micro-spectrometers, digital still and video tracking cameras, a pyrometer, and a zenith pointing pyronometer. All instruments are contained in the SIERRA in the nose-cone with the exception of the SAR which is mounted on the side of the fuselage in a pod. The SIERRA team is proud to be supporting the NASA Science Mission Directorate, Earth Science Division, Cryospheric Science Program and the International Polar Year by partnering with Dr. Jim Maslanik (U. Colorado, Boulder) and his science team on this important mission to observe arctic sea ice processes. 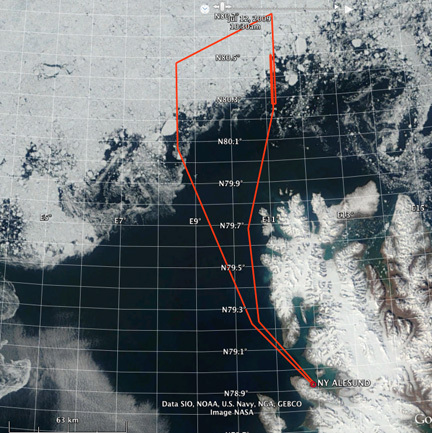 CASIE is the aircraft campaign portion of the larger, NASA-funded project titled “Sea Ice Roughness as an Indicator of Fundamental Changes in the Arctic Ice Cover: Observations, Monitoring, and Relationships to Environmental Factors. This 3-year research effort, which combines satellite data analysis, modeling, and aircraft observations, includes scientists, engineers and students from the University of Colorado, Brigham Young University, Fort Hays State University and NASA’s Jet Propulsion Laboratory working together with research aviation specialists from NASA’s Ames Research Center. Our project is attempting to answer some of the most basic questions regarding the future of the Arctic’s sea ice cover. In particular, our work will help us better understand one of the most fundamental changes in sea ice cover in recent years – the loss of the oldest and thickest types of ice from within the Arctic Ocean. This change has been rapid and extreme. For example, our analysis of satellite data shows that the amount of older ice in 2009 is just 12% of what it was in 1988 – a decline of 74%. The oldest ice types now cover only 2% of the Arctic Ocean as compared to 20% during the 1980’s. Not only does this change affect the total amount of ice in the Arctic, but it also affect the ability of the ice cover to resist increased warming. In turn, this loss of the old ice types will influence activities such as shipping and mineral exploration, and it is important for marine mammals and fish that use the ice cover as safe havens and platforms. CASIE’s role in this project is to provide very detailed information on ice conditions by using a small unmanned aircraft (NASA’s SIERRA) that can fly long distances at low altitudes – a job that can be difficult and dangerous for large, manned aircraft, especially in the harsh Arctic environment. The SIERRA is carrying a variety of remote sensing instruments that will provide information on ice surface roughness and topography, thickness, reflectance, and age. An advantage of the SIERRA compared to smaller unmanned aircraft systems (UAS) is that the SIERRA is big enough to carry all these sensors at once, yet small enough to not require a large hanger or runway. Ny-Alesund, Svalbard is an ideal location for CASIE since it provides access to the region of the Arctic known as Fram Strait. Much of the sea ice that leaves the Arctic Ocean due to transport by winds and currents passes through this relatively narrow (500 km; 311 mile) stretch of water between Svalbard and the northeastern corner of Greenland. In addition to the science benefits that Svalbard offers for CASIE, the research base at Ny-Alesund is a first-class facility that is providing everything we need for a successful experiment. Next to this blog, we will also regularly post CASIE mission and flight updates on our @NASA_CASIE twitter.